How fair are the SATs? Money and privilege are known to play a role in student scores, and the College Board is making changes. Will they be enough? Juniors’ eyes are glued to heavy Compass books as they fidget in the hallways, enveloped in insurmountable stress. There is only one explanation: SATs are coming up. This occurs every few months or so when a student anticipates taking either the Scholastic Aptitude Test or the American College Test, standardized tests the majority of upperclassmen take in order to apply to most colleges. The SAT and ACTs can determine a student’s likely tier of college application possibilities, as they are regarded as among the most important qualifications looked at in the admission process, just behind the student’s grades, according to USAToday. The reason is that the SAT is said to give an objective score rather than the GPA, which is subject to grade inflation and different standards at different schools. But how objective is the SAT? Do Shalhevet students have a level playing field with students in public schools – or with each other? Although the administrator of the SATs, the non-profit organization called the College Board, claims that it objectively scales a student’s likely ability to succeed in college-level courses, for decade Americans have complained that the tests are neither objective nor equitable, but rather give wealthier students obvious and significant advantages in both time allotted to take the test and in preparation for it. Shalhevet seems to be a case in point. According to a Boiling Point survey some students study on their own, while others spend upwards of $2,000 on private tutoring. Two students currently receive extra time on the exams – time they proved they needed, but proof they had to pay for with extensive private testing. A generation ago, people took the test without studying for it, and those who were more widely read, for example, would naturally get better scores on vocabulary sections. A decade ago, most Shalhevet students took SAT prep classes, as many still do today. Nationwide, even SAT classes are out of reach of the less affluent. “I have seen more and more kids move away from classes and more towards [individual] test prep because parents want to give the best to their kids and there is a pressure to spend more money,” said Ms. Aviva Walls, Shalhevet’s Director of College Counseling and Academic Guidance, in an interview. Another way wealth comes into play is in obtaining diagnoses that give some students up to 50 percent more time to answer the tests’ hundreds of questions. Students diagnosed with Attention Deficit Disorder (ADD), Attention Deficit Hyperactivity Disorder (ADHD), or dyslexia are allowed by the College Board to qualify for extra time and also a private room during the test. The diagnoses require psychological testing which can run into the thousands of dollars. Cost aside, Mrs. Katherine Levin, the College Board’s Associate Director of Communications, said that accommodations are necessary to make it fair for students with disabilities. She said there are safeguards to be sure the accommodations are given only to those who need them, including that students must be tested and approved by a psychologist with a Ph.D. to get extra time. But because of the cost of testing – which is sometimes but only rarely provided by the school — those very safeguards ensure that the majority of people approved to receive the benefits are raised in high-income families, according to the New York Times. Some of these families — including some at Shalhevet — invest as much as $3,000 to help their children to score as high as possible. The Boiling Point poll, conducted Jan. 29,. examined how many Shalhevet students receive professional tutoring, and of those, how many actually saw their scores significantly rise as a result. Twenty-three seniors and 18 juniors were polled. The majority of students had spent more than $1,000 on the test prep. 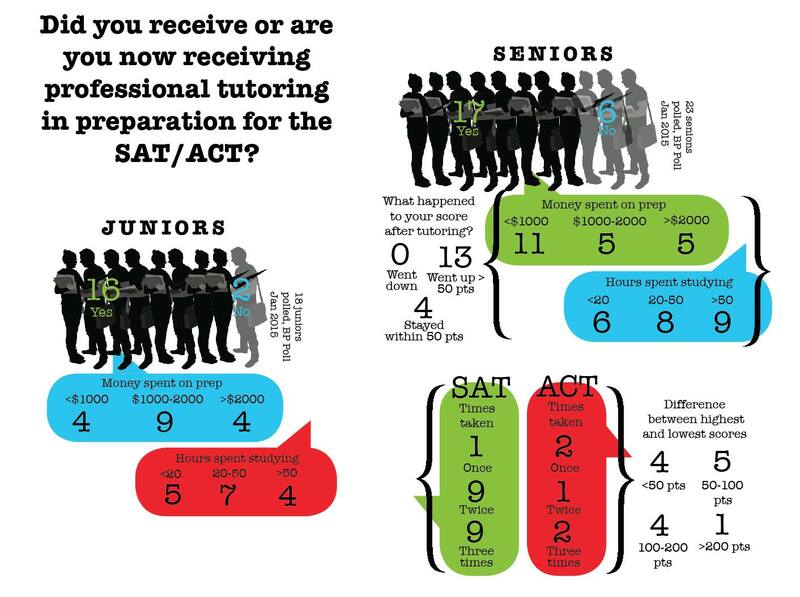 Thirty-seven percent claimed that they spent less than that, while 22 percent said they spent over $2,000; the remaining 41 percent reported that they invested somewhere in between $1,000 to $2,000 getting ready for the SAT or ACT. Eighty percent had received tutoring either through a class or individual sessions, in hope of enhancing their SAT scores. Private tutors charge between $100 and $300 a session to show students what to look for during the exam and offer tips like plugging in variables for some math questions or annotating long reading passages. They also help students with any content material they do not feel confident about. Although Ms. Walls would not weigh in on how much a person should spend towards the test, she did state when the amount of money spent becomes excessive. Most students said they’d found the tutoring very effective. Two of last year’s seniors claimed to have bumped up their scores by 350 points after tutoring, and 13 out of the 17 seniors who answered this year said their scores had increased by 50 points or more. Ms. Walls said that a major benefit of tutoring is that tutors motivate students to study for the test. “A student who is self-motivated could definitely prepare for the test himself, but I don’t know that many 17-years-olds who can motivate themselves and do practice tests without incentives,” Mrs. Walls said. “Even just being in Shalhevet and having an easier access to a college counselor is an advantage over students in public schools,” Ms. Walls said. This kind of unevenness was not lost on the College Board, which is in the process of making major changes to the exam’s format – changes that will take effect for this year’s sophomores. Right now, the SAT is divided into three sections: Math, Reading Comprehension, and Writing, which contains an essay. Each section is worth 800 points and aims to rate a student’s ability to reason quantitatively and analyze information, among many other skills. The new system brings the SAT back to the 1600-point format used until 2005, while offering students the option to take an essay test as a separate score. The two remaining sections will be math and a combination of reading comprehension and writing. “The redesigned SAT is part of a commitment by the College Board and our members to move beyond delivering assessments to delivering opportunity, “ said Mrs. Levin. Another change is that test will no longer take off points for wrong answers, so students will have more of an incentive to guess – another opportunity to learn strategy from a good tutor, some might say. But Ms. Walls said the aim was the opposite. Ms. Walls agrees that stress is high surrounding standardized exams – and maybe even higher at Shalhevet than elsewhere. She has worked in the field for 12 years, including as a college admissions officer at Barnard College and NYU, and most recently served as college counselor at New Jewish Community High School in West Hills. Ms. Walls said a sufficient amount of time to study would be at least four hours a week for the two months before the test, which amounts to a minimum of 16 hours. If it was all tutoring, it would $3,200 at the average rate of $200 an hCounting studying time, Shalhevet students polled were doing much more than that. Eleven said they spent less than 20 hours studying for the SATs or ACTs. Fifteen put it between 20 and 50 hours of studying, and another 14 stated that they even studied for more than 50 hours. Twenty-one of the 23 seniors polled had taken the exam at least twice. One senior had taken the SATs threes times and then the ACT once for a total of four attempts, though Ms. Walls advises to stop after taking it a third time. Taking the test multiple times does seem to benefit most people, as 36 percent of the students who answered this question scored at least 100 points higher on their best than on their worst score. Only 21 percent, on the other hand, had less than a 50-point increase. Alumna Sarah Soroudi studied well above 50 hours for the test. She had been tutored a few times a week for seven months prior to the exam date, and she studied outside of her tutoring sessions as well. After all the preparation, Sarah’s score went up by 350 points. Sophomore Sarah Yadegari said that even though the SATs may become easier, she does not plan on studying less than she would have studied for the current test. So is there any hope for less stress, less studying or less tutoring down the road, or will counselors’ advice and the newly designed test have no effect at all? Sara Dalhed, the Managing Director of Compass Beverly Hills, a tutoring company, said that the redesigned SAT format will make it harder for students taking the SAT to attain those extra resources and practice tests. She predicted more students would switch to the ACT, to take advantage of professional help. “We are definitely going to use a different strategy” Sara said. “If you are a junior now you can try the current versions of the SAT and ACT and we have an equal amount of practice material for you. Stress and pressure, according to Mrs. Walls, can lead to misplaced priorities. But fair or not fair, a good use of time or not, standardized tests seem likely to stay a vital component of the college admission process, perhaps to the dismay of the upperclassmen of today – and tomorrow.